And Matzah bread, and Matzah loaves fried in oil, and wafers (Rekikim) of Matzah, annointed with oil, our of fine wheat flour, you should make them. וְלֶחֶם מַצּוֹת, וְחַלֹּת מַצֹּת בְּלוּלֹת בַּשֶּׁמֶן, וּרְקִיקֵי מַצּוֹת, מְשֻׁחִים בַּשָּׁמֶן, סֹלֶת חִטִּים, תַּעֲשֶׂה אֹתָם. Here we are told that Matzah is made out of fine wheat flour, it can be either fried (Matzah loaves fried in oil) or baked (Matzah bread), and that it is a flat wafer (Rekikim of Matzah). The fact that the verse had to explicitly say to add oil to it is telling us that the original Egyptian recipe did not have oil, and Moses was adding it here to make it fancier. But some say that once, when the Ethiopians had marched against Egypt, a great number of bands of wolves (lykoi) gathered together and drove the invaders out of the country, pursuing them beyond the city named Elephantine; and therefore that nome was given the name Lycopolite and these animals were granted the honour in question. But Moses prevented the enemies, and took and led his army before those enemies were apprized of his attacking them. For he did not march by the river, but by land; where he gave a wonderful demonstration of his sagacity. For when the ground was difficult to be passed over, because of the multitude of serpents, which it produces in vast numbers; and indeed is singular in some of those productions, which other countries do not breed; and yet such as are worse than others in power and mischief, and an unusual fierceness of sight: some of which ascend out of the ground unseen, and also fly in the air, and so come upon men at unawares, and do them a mischief; Moses invented a wonderful stratagem to preserve the army safe, and without hurt. For he made baskets, like unto arks of sedge, and filled them with Ibes, and carried them along with them: which animal is the greatest enemy to serpents imaginable; for they fly from them, when they come near them, and as they fly they are caught and devoured by them; as if it were done by the harts. But the Ibes are tame creatures, and only enemies to the serpentine kind. But about these Ibes I say no more at present, since the Greeks are not themselves unacquainted with this sort of bird. As soon therefore as Moses was come to the land which was the breeder of these serpents, he let loose the Ibes; and by their means repelled the serpentine kind, and used them for his assistants before the army came upon that ground. When he had therefore proceeded thus on his journey, he came upon the Ethiopians, before they expected him; and joining battel with them, he beat them, and deprived them of the hopes they had of success against the Egyptians: and went on in overthrowing their cities, and indeed made a great slaughter of these Ethiopians. It is peculiar that in both stories it is animals that save the day. In one story it is wolves and the other it is Ibes. The Egyptian words for Ibis and for wolf are very similar. Ibis in Ancient Egyptian is called Hib and wolf in Egyptian Arabic dialect is called Dib (ديب). It is possible that the two words were confused, most probably by the Greeks, at some point and the original story that had Ibes in it was changed to have wolves. In Asyut, the Ancient Egyptians worshipped a god called Wepwawet, who was represented as a wolf and they sacrificed many wolves there which were turned into mummies. Wolf mummies were discovered near Asyut in the grand tomb, by a French Archaeologist, Pierre Lacau, in 1922. See Lacau, Pierre. “Rapport sur les travaux du service des Antiquité de l’Égypte en 1921-1922.” Comptes rendus des séances de l’Académie des Inscriptions et Belles-Lettres 66, no. 5 (1922): 372-380. Assuming that when Moses was on this campaign he was stationed in the city of Asyut and it is there where he learned to make Matzah according to the local recipe. Not only did he introduce this recipe as the recipe of victory of the Israelites over the Egyptians, just like in his younger days it was the recipe of victory of his Egyptian army over the Ethiopians, but he also preserved its local Egyptian name – Raqaq, which made it into the Torah as Rekik. The reason given in the Bible in Exodus in 12:39 for why the Israelites baked Matzah and not regular bread, being that they did not have enough to wait for the dough to rise, seems to be a gloss of a later editor who tried to explain it. It is very obvious from the narrative that the Israelites had plenty of time, because they spent that night collecting gold, silver and clothing from the Egyptians as described in Exodus 12:35. Also the commandment to eat Matzah that evening was given prior to the Exodus beginning and prior to the tenth plague of striking the first born, as clearly stated in Exodus 12:15-20. Finally, in Exodus 12:34 we are told that the Israelites took out of Egypt raw dough which they intended to bake later in the night, for which it would have been impossible to remain unleavened had they waited for hours to bake it, which proves again that they had plenty of time to wait for it to rise. It becomes quite obvious that Moses had in mind all along to command the Israelites to eat Matzah on the night of the Exodus and on Passover for generations to come as a symbol of their victory and it had nothing to do with them not having enough time to bake regular bread. The only other detail that needed to be worked out was what kind of wheat flour did the ancient Egyptians use to bake their bread. There were only two types of wheat in the ancient Mediterranean world: Emmer (Triticum dicoccoides) and Einkorn (Triticum monococcum). In Egypt, Emmer was used almost exclusively and Einkorn was rare. See Nesbitt, M., and D. Samuel. “From staple crop to extinction? The archaeology and history of the hulled wheats.” Hulled wheats 4 (1996): 41-100, p. 76. 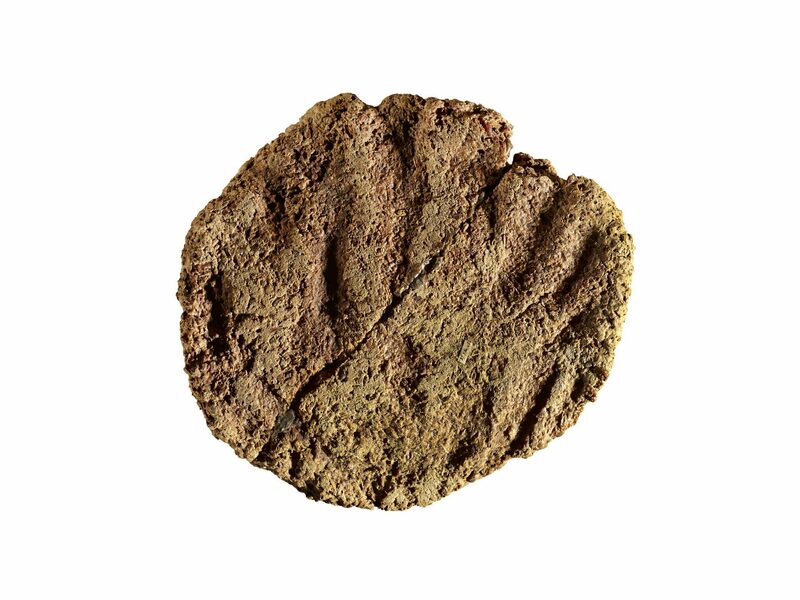 This wheat was lost to history until in 1906, a Jewish agronomist, Aaron Aaronsohn, discovered wild Emmer growing in Rosh Pina, Israel and publicized it as the original wheat used in the ancient Near East and the predecessor of all modern wheat species. For more details on this discovery, see his book, Aaron Aaronsohn. Agricultural and botanical explorations in Palestine. No. 180. US Government Printing Office, 1910. 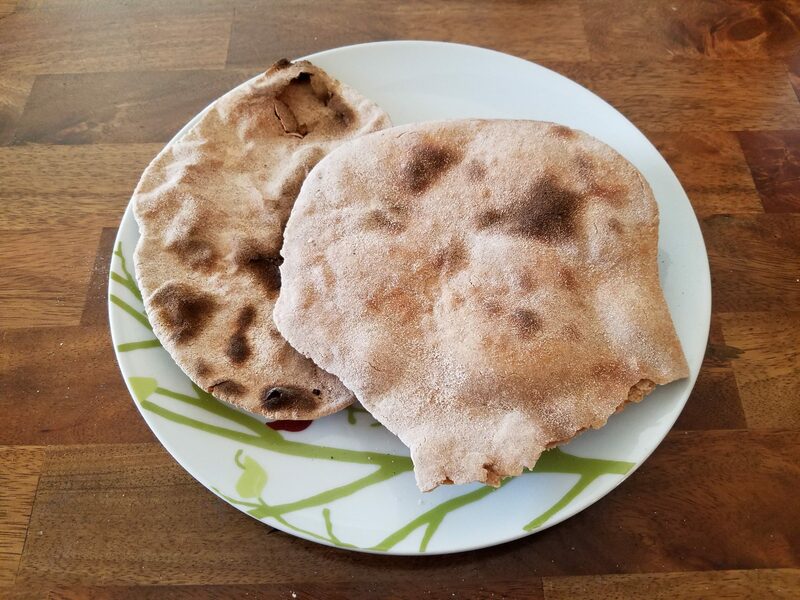 I have recreated this recipe using Emmer Wheat and the same basic recipe as the Egyptian Raqaq, which I believe is the original Biblical Matzah recipe. In case you are curious if my Matzah looks like the original Egyptian Matza, you can compare it with actual loaves of unleavened bread excavated from Thebes, Egypt that are kept in the British Museum. Dish of woven palm leaf, with two loaves of unleavened bread. One piece of bread has hand imprints on both sides of the loaf, probably left by the baker. From Thebes, Egypt. British Museum, EA5341. 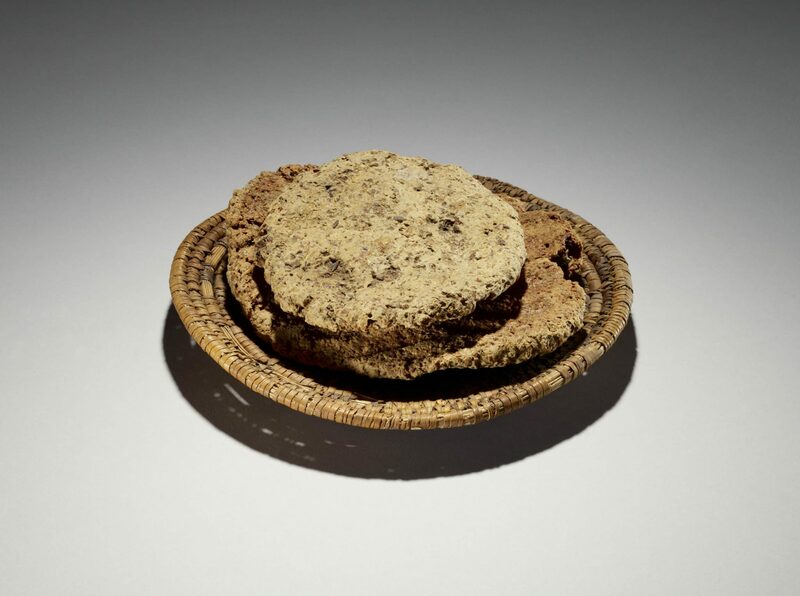 Front of Loaf of Unleavened Bread from Thebes, Egypt. British Museum, EA5341. Biblical Emmer Wheat Passover Seder Rekik Matzah is made with ancient Emmer Wheat and water only. It is Kosher for Passover according to strict rules of Kashrut and can be used to fulfill the commandment of eating Matzah during the Passover Seder. This recipe has been recreated based on an ancient Egyptian recipe for a flat bread called Raqaq, which is identical to the Biblical Matzah made during the Exodus, and called Rekik Matzah mentioned in Exodus 29:2 and Numbers 6:15. Place 1 1/2 cups of the Emmer Wheat flour into a large stainless steel bowl in which the dough will be kneaded. After 1 minute open the oven door and check if the Matzah started to become slightly brown and bubbles started forming on top of the dough. Once that happens flip all 3 Matzot onto the other side. Check the Matzah again after no more than 1 minute. The total baking process should take no longer than 2-3 minutes. The Matzah should be soft, but firm, and might be crunchy especially around the edges. Emmer Wheat Matzah should taste similar to Whole Wheat Pita, but sweeter, with a slight crunch. Why does this recipe omit oil as an ingredient, when both Exodus 29:2 and 6:15 mention oil as part of the recipe? Those are not the same Matzah. The Matzah with oil was a sacrifice and was only eaten by the priests. Passover Matzah is regular non-sacred food and is eaten by everyone. Where does one find emmer wheat? Thank you for your interest. You can buy Emmer wheat flour online. I get mine from this company. https://bluebirdgrainfarms.com/product-category/organic-emmer-farro-products/ . They also sell it at Whole Foods in the flour section.